V.com weekend vote: Do you have perfect pitch? Ever since my high school friend Trina showed me that she could identify the pitch of a doorbell or a car horn with no reference point at all, I've longed for perfect pitch. How cool is that? She could also see a note on a page and then sing it accurately, just picking it from the air. Wow! Though I can't do that, I do have relative pitch, and that allows me to do things like sing in tune, play in tune, and do a transcription from a point of reference. I'm told that perfect pitch doesn't help you play in tune and can actually hinder that (when the orchestra has to tune to a different pitch, like the A=415 in Baroque music or a really flat church organ), but honestly, everyone I've known with perfect pitch has also played quite well in tune! So what exactly is perfect pitch? Perfect pitch, or absolute pitch, is the ability to accurately identify a pitch, with no reference point. Relative pitch is the ability to identify pitches, but with a reference point. Can perfect pitch and relative pitch be learned? I think so, at least to a degree. I do wonder how much having those pitches identified as a young person helps a person to have "perfect pitch." Until I was nearly nine and started learning to play the violin, I was fairly unaware of the fact that music notes even had names, much less could I name them! Do you have perfect pitch? What are your thoughts on the matter? Discussion: Which violinists have perfect pitch? Great choice for weekend vote! As part of my jazz piano studies in high school, I had ear training where I would have to identify intervals, triads, inversions, etc. The point of all that was to build skills needed for transcribing solos and playing by ear. This is essentially relative pitch training, no? If so, then my own experience is that relative pitch can be learned because I definitely improved. I never tried to train myself on absolute pitch but I would be curious to know if folks think this can be learned too. I'm pretty sure I don't have perfect pitch, but I do know if my violin A is even very slightly out of tune when I pluck it on taking the violin out of its case. I suspect this is no more than an instilled memory of the A440 frequency from a lifetime of tuning to the oboe A in orchestras. I have perfect pitch, something I realized around 13 y/o. I first discovered that I could identify the key of a piece just by listening. Then I discovered I could identify individual tones. The radio tone at the top of the hour for some networks is A-440. The microwave I have beeps on a C. One of my phones rings in E.
Since 415 is about a half-step below 440, I just think of a piece written in A as being played in A-flat when the players use 415 tuning. What really throws me off is tuning somewhere between 415 and 440. Fortunately, I have strong relative pitch; so I can adapt to playing with a piano in the ensemble that has its tuning a bit off. For my own practicing and playing, I use 440. I had very accurate perfect pitch (and a nuisance it was sometimes - My second teacher had relative pitch only; or so she said, see later), but it's not now as reliable as it used to be. Musicians tend not to try to develop perfect pitch. I do remember, however, reading about police workers, who worked with certain machines that gave them a sound at a particular pitch. Over time these police workers found they could recognize the pitch very accurately. This is a bit garbled, I can't remember the details, I think all this was to do with solving crimes, but it does suggest to me that perfect pitch could be learned. I believe pitch accuracy can be learned, and the earlier the teaching begins, the easier it is. My mother taught note matching when I was two. I have relative pitch because I can "find" a 440 A accurately, and then relate the other pitches on the treble staff to that note. I don't read nor know base clef notes, because I learned violin early, but not other instruments. All of this is learned. Some increased accuracy can be taught at later ages, but it takes a lot of repetition and practice. 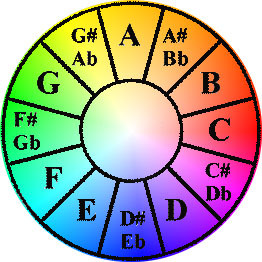 I'm glad I have "only" relative pitch; playing with A415, A440, etc., with perfect would be amazingly tough, I should think, and I do play with groups that use the different As. I was interested in Jim's comment that he can determine the keys of pieces by listening. I can do that, even though I do not have perfect pitch, but only with solo or small-chamber string music. Just listen for the ring-tones on the violin (or cello), determine their location with respect to the scale of the key in which the piece is written. Initially it took a few minutes of intent listening but I'm getting better at it. My violin teacher said she had perfect pitch. She told me the story about one time when she was a child she was supposed to play in a recital but when she found out that the piano that was to accompany her was out of tune, she had to run home and find one of the few pieces of music that she could play with that piano accompaniment. I don't have perfect pitch so I didn't understand the story completely and I may have misunderstood. It's too late to ask her for clarification, but maybe another respondent can clarify. No "perfect pitch" for me, but I must have become somewhat like Trevor Jennings as a result of some 40 years as an orchestral fiddler. In retirement I learned to play the oboe to help out at a local amateur orchestra. When giving the "A" the flautist next to me will get out his electronic pitch checker. Sometimes, if he is slow in producing and switching on his device, I find that my "A" will be already spot-on. And make no mistake about it, the lips can vary the pitch of any oboe note by quite a lot. So I'm a one-note perfect pitcher. I too am glad to not have it. Pitches and note names are variable, even in a440. So any sense of perfect pitch is your brain feeding you misguided information. Also - how can a person have perfect pitch without having learned about why notes have which names. And even the person who said that working with A=415 - or such- adjusts from thinking about A as 440 and thinks of it as though the A flat is now A. Seems that all of these are Relative Pitch recognitions with some being better at it than others - more naturally receptive, having to work less. i play wind instruments. i have relative pitch. applying relative pitch to make the interval i need for the note. Likewise, hearing a note, i can often figure out the interval i need to get to my mental image of 'A' and that tells me what the heard note is. I don't give this project a lot of priority but spend a little time at it because i was always curious whether perfect pitch could be learned. I now feel pretty sure it can. "perfect pitch"" is a curse not a gift. "Since 415 is about a half-step below 440, I just think of a piece written in A as being played in A-flat when the players use 415 tuning." In other words, with my 440-pitch orientation, it's as if they had transposed the piece down a half-step to A-flat. And I have found myself in "a situation with a different A -- say 436 or 443" -- e.g., having to play when the accompanying piano is tuned lower or higher than 440. Fortunately, I also have good relative pitch, and here is where relative pitch takes over. In high school musical shows, we, the orchestra, sometimes had to transpose a number down or up a half-step -- sometimes more -- to suit the individual singer's voice. In opera, the conductor occasionally has to tell players on the very day of the performance to do this; e.g., if the lead baritone is unwell and can't sing the high G called for in the score -- but can still hit high F.
For players so bound by it that they can't function musically apart from 440 -- or whatever their usual reference point is -- this is probably true. I have perfect pitch and strong relative pitch. The former has come in handy -- never considered it a curse; but I find the latter far more valuable to overall musicianship. "I too am glad to not have it [perfect pitch]. … any sense of perfect pitch is your brain feeding you misguided information." Information isn't misguided. People are misguided. Also, if you don't have perfect pitch, how can you be so sure what perfect pitch is and isn't? I have perfect pitch. Best way I can describe it: It's like being able to tell colors apart -- or like voice recognition. In this case, it's pitch recognition or pitch memory. -- I stand by my statement as well. I don't know if this is "pretty common." I majored in music and personally knew at least one player with this problem -- a pianist who had to play a piece written in A-flat on a piano with tuning a half-step low. The piece sounded as if she were playing it in the key of G instead. She told us, "I could not play." I suspect the problem is more common among pianists than violinists, but I'd have to do some research on that point. Fortunately, my sense of perfect pitch isn't so absolute and inflexible that I can't tune lower or higher than 440, if I have to, and still play just as well. As long as I've mastered the material and have had at least one run-through with my ensemble partners, I'm fine. But preparation and run-throughs are expected anyway, whether at 440 or some other tuning. Then, too, during performance, violin strings can drift off pitch, as you know, and players routinely compensate -- often only subconsciously. Again, this is an example of where relative pitch comes into play. But my adaptability and strong sense of relative pitch haven't at all diminished my sense of perfect pitch -- the ability to name individual tones and keys. You've reported that you don't have perfect pitch. I do have it, and I've proved it over and over. I know what I'm talking about. After consulting a dictionary, I stand by my use of the word "misguided". I'm basing this on what other people have said, as well as extrapolating from other things my brain does. It seems pretty common that people with perfect pitch have difficulties playing and listening to other frequencies of A. You mentioned relative pitch needing to take over with A=436. But that's actually the value of A when when played together in just temperament with a C in A=440.